Seqrite endpoint security is a simple and comprehensive platform which integrates innovative technologies like Anti Ransomware, Advanced DNA Scan, and Behavioural Detection System to protect your network from today’s advanced threats. It offers a wide range of advanced features like Advanced Device Control, DLP, Vulnerability Scan, Patch Management, Web Filtering, Asset Management, etc. under a single platform to enable organizations to ensure complete security and enforce control. 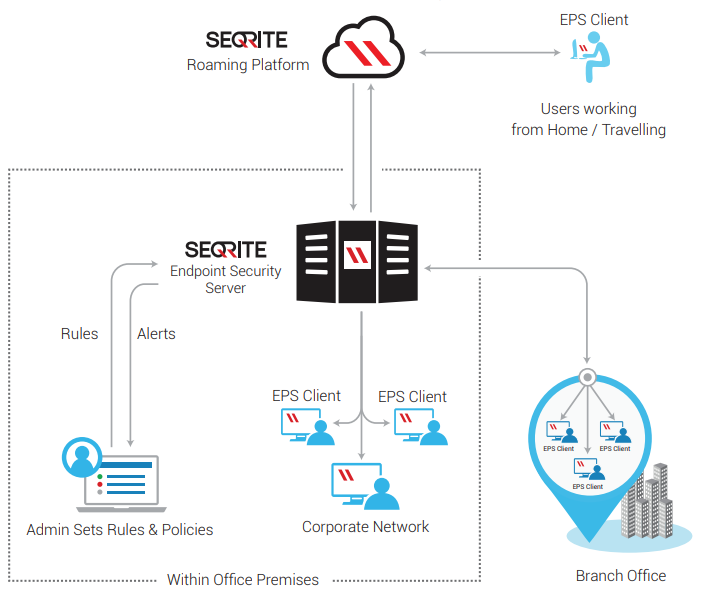 Comprehensive Endpoint Security and Control:- Seqrite Endpoint Security is a simple yet powerful platform to manage security and helps to enforce control over data, application, web access with a wide range of features such as Advanced Device Control, DLP, Asset Management, Application Control, etc. Multilayered Protection:- Seqrite Endpoint Security is certified by various industry certifications and integrates innovative technologies like Advanced DNA Scan, Behaviour Detection, Anti Ransomware to protect your systems from malware and advanced threats at different levels. Scan and patch application vulnerabilities:- Seqrite Endpoint Security detects application and operating system vulnerabilities and also helps to fix those by installing missing patches. Regular updating of applications makes the network less vulnerable to malware attacks. Centralized Management and Control:- User friendly interface for monitoring, configuring and managing systems in the network with detailed report and graphical dashboard. Primary and Secondary Server architecture to manage distributed network effectively. Offers malware protection that is certified by leading industry certifications. Protection from ransomware attacks and automatically takes back-up of files. Gives total visibility of hardware and software running on endpoints and also helps to track software / hardware changes happening on endpoints. Enforce policies regarding the use of storage devices, mobile and portable devices, wireless devices, network interfaces connected to endpoints. Web-based console with graphical dashboard, group and policy management, email and sms notification, easy deployment. Manage clients even if they move out of the corporate network. Provides summarized view of vulnerabilities as per severity. Centralized patch management solution to patch vulnerabilities of Microsoft and Non-Microsoft application. Detects malicious network activities which exploit application vulnerabilities and blocks intruder attempts. Monitors inbound and outbound network traffic based on rules. Alerts about port scanning attack. Blocks sites as per its categories.